After last week’s meal at Grahamwich I was looking for a healthy option for lunch. I had heard the buzz about Native Foods but was a bit skeptical. I’ve encountered vegan food dressed up to “be like” burgers, pizza etc. and have been disappointed. 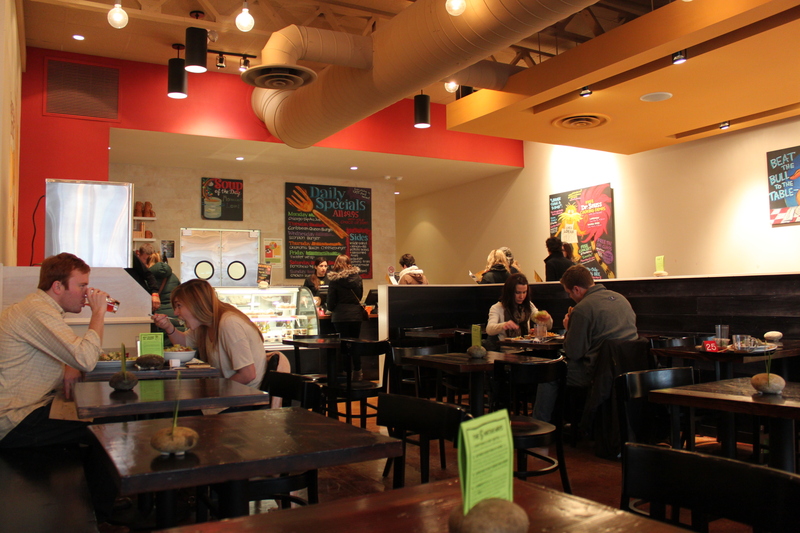 After my experience at the Native Foods Cafe in Lakeview I couldn’t believe it took me so long to get there and I am very happy I live close by for future visits. 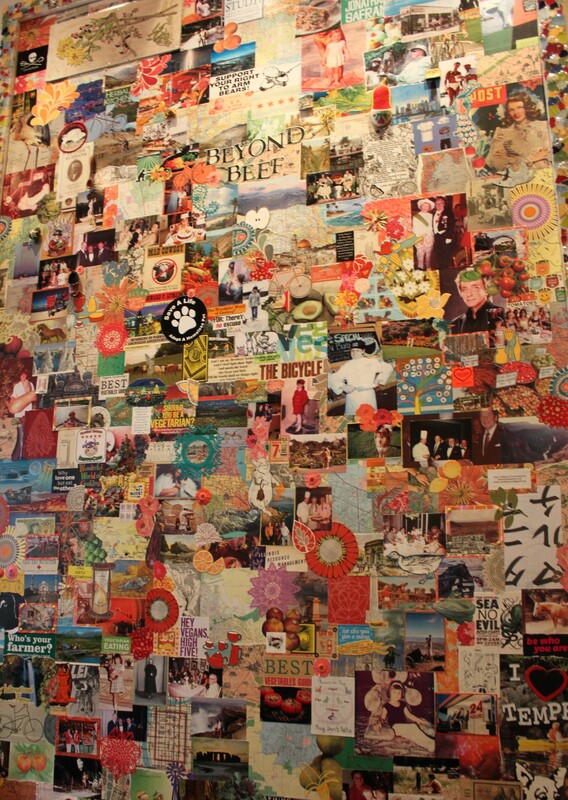 The Cafe is bright and open with artwork covering the walls. The staff was really helpful to this newbie and even complemented me on my order. I signed up for a Native Rewards card and received a free drink. 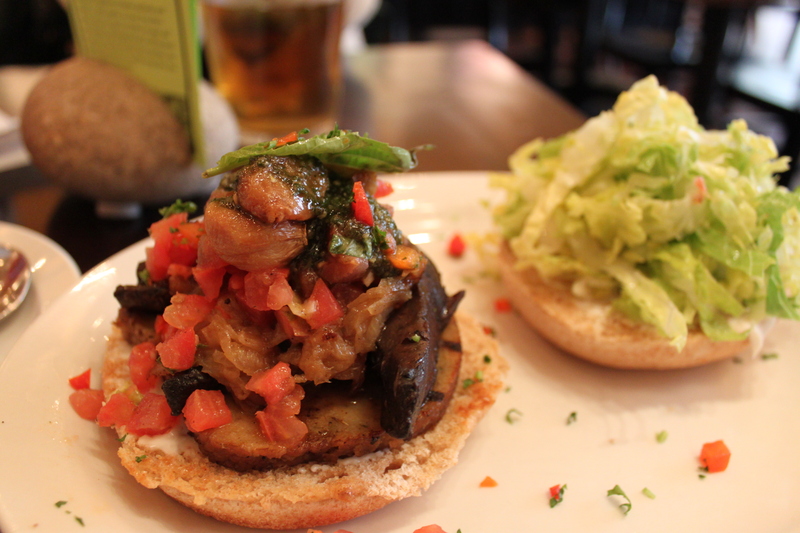 The Portobello and Sausage Burger was the special for the day and come with a side. 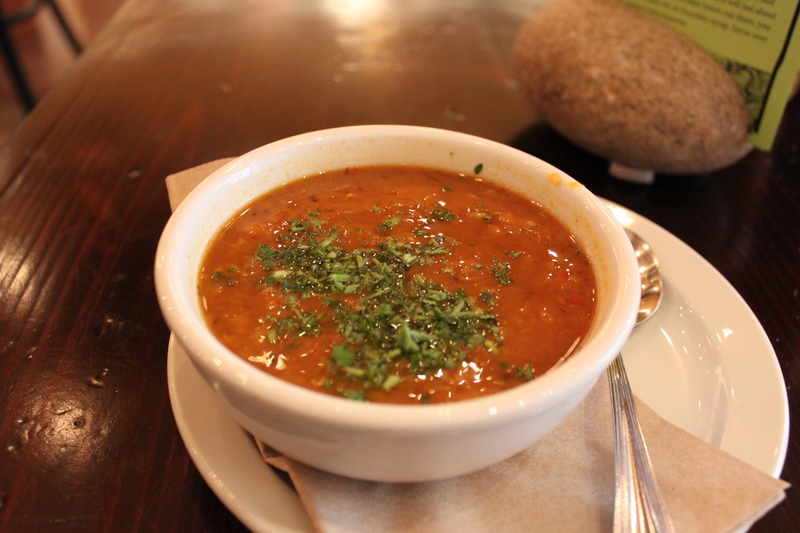 Next time I am there I will get the sweet potato fries but this time I chose the Moroccan Lentil Soup. It was packed with flavor, hearty and with a healthy garlic kick. Might not want to order it if you are on a date. The Portobello and Sausage Burger have juicy grilled portobellos, homemade Native Sausage Seitan, caramelized onions, pomodoro, sweet roasted garlic, creamy pumpkin seed pesto and mayo. This was definitely the best vegan burger I have had and better than any veggie burger I have had and up there with the best turkey burgers I have had. In fact, if I had to choose between this and a turkey burger I would choose the vegan burger. For real. The portobellos were grilled to perfection, tender, meaty and earthy. The Seitan (protein rich wheat meat alternative with a similar texture to meat when cooked) was reminiscent of sausage but wasn’t trying to be, I thought it tasted better. Rich and a bit spicy. The pomodoro, garlic and pumpkin seed pesto were a great combination and added more complexity to the burger. Can you tell I liked it? 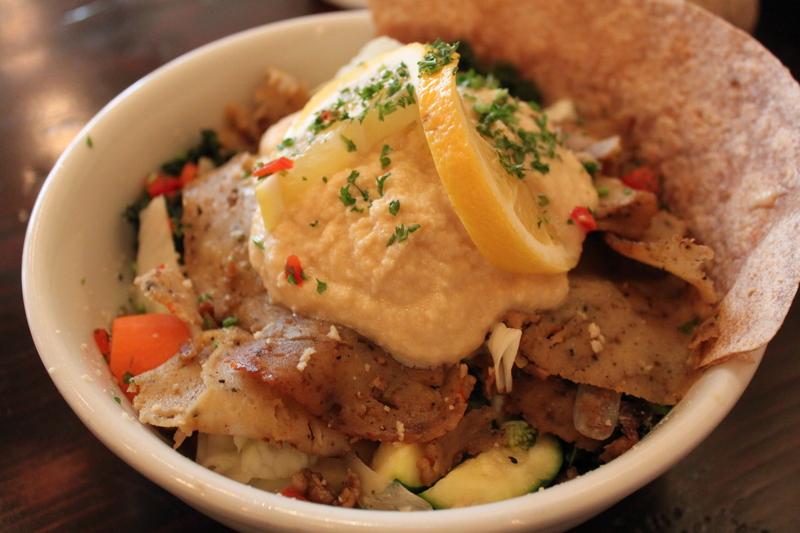 The Greek Gyro: thinly sliced Native Peppered Seitan sautéed with shallots on quinoa, steamed vegetables, and kale with lemon garlic sauce and hummus. Served with grilled flatbread. This is truly a bowl of goodness. So many flavors and I can’t believe that something this healthy can taste so good. Moral of the story, get you to Native Foods Cafe. It’s whole foods made deliciously and affordable. Not to mention the fact there are 3 Chicago locations.